A fascinating (and alarming) new way to procrastinate at work understand the effects of climate change: Flood Maps. Using elevation data in combination with Google's map technology, you can create a visual depiction of rising sea levels right in your own neighborhood. Start at 7 meters and work your way up to 14. Truly, it's amazing. 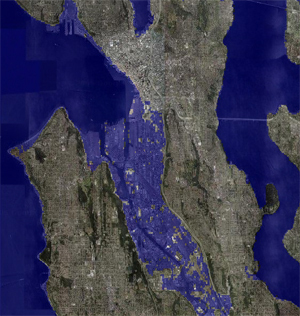 The satellite "photo" at left is what downtown Seattle would look like with a 7 meter rise in sea levels: adieu Georgetown, Harbor Island, Interbay, and SoDo. I copped this one from Alex over at WorldChanging. Also at WorldChanging, Jamais Cascio has a good post on Flood Maps and the science of rising sea levels. The President famously said in his State of the Union address that the United States is "addicted to oil." We couldn't agree more. Today, his administration issued its treatment plan: abuse oil a tiny bit more slowly, eventually, as the New York Times reports. The "treatment plan" I'm refering to is the US Department of Transportation's new CAFE standards for light trucks. The department heralded the new standards as the largest boost in efficiency in decades, which is true -- because the standards have been stagnant for decades. So an 11 percent increase over the next five years, is something. It's more than lipstick on a pig. The plan covers somewhat larger SUVs than before, which is good, but it still excludes the largest SUVs, such as the Hummer H1. It bases the fuel-economy standard on vehicles' footprint, which is also good. But the plan ignores new technologies sweeping the market that make an 11 percent increase an extremely low bar. Light trucks might well improve by more than that anyway, thanks to high fuel prices and the popularity of hybrid-electric drives. In a time of soaring oil prices, national insecurity by the barrel, worsening hurricanes and other signs of climate change, I had hoped for better. The new standards are certainly more than lipstick on a pig. They're lipstick and an evening gown. Six weeks ago, my 18-year-old son slammed our 19-year-old Volvo stationwagon into the rear of a high-clearance pickup. All the people were fine. So was the pickup. But the Volvo wasn't, as you can see in this photo. Repairing It would have cost many times the Blue Book value. So we accepted the insurance company's check for $594 and bid farewell to the family car. Happenstance thus made us car free. But we decided to stay that way . . . at least for a little while. OK, actually, it's more of an experiment, to see whether a middle-class family of five can live a contented life in Cascadia's largest city without owning their own car. Why are we doing this? Cost, conscience, and capability. Capability--in other words, because we can. Thanks to past choices plus some good fortune, car-free living is a smaller disruption for us than for most people. Our kids are old enough (the youngest is now 11) to walk or bike unaccompanied to a lot of places. We live in a compact city neighborhood with an abundance of nearby amenities. We've got respectable local transit service and five FlexCars stationed within a mile of our home. We're only six weeks into this new lifestyle, so I don't want to make too many conclusions. But so far, what's surprised me haven't been the moments of inconvenience (I expected those). It's been two unexpected pleasures: more little adventures every week and fewer backseat arguments to referee. We're walking more, biking more, planning our activities more thoughtfully, and appreciating the FlexCar when we use it. My 12-year-old daughter said to me the other day, laughing at herself as she said it, "I'm noticing that cars go fast, really, really fast." It's all very new, so this feeling may dissipate with familiarity. But so far, the biggest bonus of car-free living has been an added increment of mindfulness. Who'd have thought that wrecking the family car would be good for our souls? There's much more to say about this experiment, but I'll save it for another installment. In the meanwhile, I know there are lots of car-free readers of this blog. I'd welcome your advice, especially if you've got kids. Yesterday I was lucky enough to see Al Gore's presentation on climate change. A remarkably thorough-going look at the consquences, Gore somehow managed to be simultaneously panic-inducing and inspiring. Not only was his slideshow easily the best slideshow I've ever seen on this, or any other, subject, but Gore himself was a study in mastery--at once funny and earnest, erudite and thundering. (Where was this guy during the 2000 campaign?) If you ever have a chance to see him speak on global warming, drop what you're doing and run, don't walk. Trying to recap his talk in a blog post would be an exercise in futility. You know the drill by now anyway: collapsing ice sheets, shrinking glaciers, spreading diseases, hurricanes, and floods. The punishment that climate change promises to inflict is downright biblical in scale--a punishment that will fall especially hard on the poorest and weakest on earth. And so it was good to hear Gore's booming declaration that arresting climate change is not a political issue, but a basic moral one. Gore was here in Seattle, you may know, because of mayor Greg Nickels' pledge to bring Seattle into compliance with Kyoto--a pledge that 218 other cities have joined. Today marked the release of the city's Green Ribbon Commission report that details how Seattle will get there. Media coverage here and here.